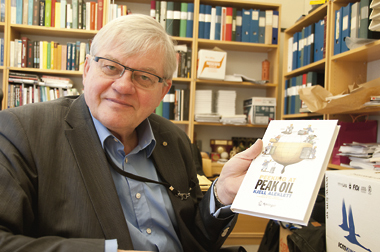 Interview: Professor Kjell Aleklett of Uppsala University has recently published the book Peeking at Peak Oil that has aroused considerable attention worldwide. The professor’s energy journey that culminated in this book began at a meeting of the Liberal Party of Sweden in Katrineholm in 1995. Uppsala University will soon institute a full-scale research programme in Global Energy Systems. The man behind the project is Professor Kjell Aleklett. This year he has published the book Peeking at Peak Oil that has received broad attention. Currently he is travelling the world to speak to parliaments and powerbrokers about how long oil will last. “My great energy journey” is how Kjell Aleklett describes the events that followed a meeting of the Liberal Party of Sweden in Katrineholm in 1995. Twenty years ago Kjell Aleklett was a local Liberal Party politician in Trosa. But he was also a physicist and engaged in the debate around Swedish energy policy, that has long been a politically contentious area. The then Liberal Party leader, Bengt Westerberg, also had his summer house in the area around Trosa. If there was a risk, however slight, that energy policy (and, at that time, primarily nuclear energy) could be an issue in the 1994 election then Bengt Westerberg wanted to be prepared. Kjell Aleklett was a good source for information. – We lived close to one another during summer so Bengt was over for dinner with us one evening, said Kjell Aleklett. It was then that Kjell gave his analysis of nuclear energy to Bengt. As it turned out, an overly intensive debate on nuclear energy did not occur during the 1994 election campaign. But the election was a loss, both for the party leader Bengt Westerberg and local politician Kjell Aleklett. But the energy issue did not die. After the election (and at Kjell’s initiative) the Liberal Party organised a conference on energy in Katrineholm. It was well attended. The magazine NU was there and reported. Having lost government, there was the need to construct a new policy on energy for the Liberal Party. After the conference at Katrineholm, Kjell Aleklett was clearing his desk. More or less by chance, he found a letter from Uppsala University. In the letter the University was seeking ideas for new courses and the deadline for responses was that same day. – I thought about it for a moment. Then I took up the programme for the Liberal Party conference that we had just held in Katrineholm. This, I thought, was exactly what was needed as a university course. – I assembled an application to start a course in energy knowledge. The idea was that, when one had completed the course, (that would require tertiary level studies), one would be able to understand a professional-level article on energy policy. The application was submitted and subsequently accepted. It’s quite interesting that I simply used the programme from the Liberal Party conference as background material for the course. The rest is history. The course was started. A year later Kjell Aleklett suggested that a correspondence course should be established and he received one million Swedish Crowns to do so. In order to evaluate the course its participants were divided into three groups. One third were to be decision makers (invitations to the course were sent to all members of parliament), one third would be teachers and one third were to be common students. The project was a component of the national investigation into distance education (DUKOM). It succeeded beyond expectations. This was education – and certainly needed – not least by the teachers and decision makers. But at that time Kjell Aleklett was also devoting time to research as well as politics. In 1998, however, politics got the upper hand. For the 1998 election he decided that there was a greater opportunity to influence Swedish environmental and energy policy from within the Swedish parliament than from without. Therefore, he conducted an intensive campaign to be elected as a Liberal Party parliamentarian from Sörmland. But the 1998 election was a loss for the Liberal Party. In Sörmland the Liberals lost their only representative and there was no position for Kjell Aleklett. Then, only two years later Kjell Aleklett, at that time an Associate Professor at Uppsala University, was promoted to full professor. – That was gratifying but also not an easy change. As a research professor in Uppsala I had to give up politics, says Kjell Aleklett 12 years later. And that was just what he did. Giving up politics was possibly the lesser problem. Leaving his beloved Trosa to live in Uppsala was probably harder. But it was then that his “energy journey” took on a global focus. 12 years ago, at the turn of the millennium, Kjell Aleklett was talking with Colin Campbell who was planning to start a new organisation to study the future of crude oil and unconventional oil. It was then that he and Colin Campbell coined the expression “Peak Oil”. The organisation received the name ASPO, the Association for the Study of Peak Oil, and it is still an international organisation of which Kjell Aleklet is president. In 2002 Kjell Aleklett took the initiative to organise an international conference on the issue of when the world would reach the maximal rate of oil production, Peak Oil. Since then ASPO has continuously advanced its ideas on a peak and subsequent decline in oil production. In most nations a seed of understanding has been sown but it is not accepted everywhere. – Ten years ago our data showed that the world would not be able to continuously increase its production of oil. Then, our prognoses showed that we might be able to produce 85 million barrels of oil per day at maximum in around 2011. In reality, the production rate reached only 82 – 83 million barrels per day. The inability to increase oil production further has caused the price of oil to increase by a factor of four. An example of the consequences of this is, according to Kjell Aleklett, what has happened to SAS. That airline has been forced to increase ticket prices to cover its increased fuel costs, and have now problems. – We see this all over the world today. Every nation must pay its own energy bill. And the days of low oil prices (i.e. $25 per barrel) will never return. Energy is what supports economic productivity in every nation, says Kjell Aleklett. If a nation cannot maintain its energy supply then it will suffer enormous economic problems. However, currently and for decades past, energy has never been a significant factor in the study of national economics. – The economic models we have used so far will not function in future, says Kjell Aleklett. The cost of energy has a direct influence on a nation’s economy. If the cost of energy rises and one is an energy importer, then one must pay for this with increased income from exports. If a nation is unable to do this then it will accumulate debt, and this is what has happened in Greece, Italy, the USA and many other nations. – We have coped better in Sweden since we, for example, export iron ore that has also risen in price. What this means in practice is that we will not be able to continue much longer using cheap energy (oil). Instead, we already must begin to plan to complement this with more expensive energy. And by more expensive energy Kjell Aleklett means renewable sources of energy such as windpower. This is necessary, but for it to happen courageous politicians are needed, he says. Every nation must pay its own energy bill, otherwise it will have severe economic problems. Energy is the basis of production in every nation. What is it that Kjell Aleklett has done that is so remarkable? – We have gathered together a very large amount of data on oil production into a common database. By analysing these statistics we can determine the limiting values of geological parameters, he says. What this means in practice is that he and his research colleagues in Uppsala can attempt to determine how much oil can be extracted from the world’s oilfields and also the timeframe for that extraction. “The size of the tap is more important than the size of the tank”, says Kjell Aleklett who as long ago as 2002 warned that we would not be able to increase oil production after 2010. – What we examine is what happens when a “tap” is installed into an oilfield. How viscous is the oil? How porous is the rock of the oilfield containing the oil? What pressure is the oil under? To date Kjell Aleklett has led a limited research programme but the decision has now been made to establish it fully and to make it permanent. There will be no shortage of tasks for it in the future. One of the major difficulties we face is obtaining correct statistics. In many nations these are confidential information. Therefore, it is, for example, easier to assess the size of the oil resources of the North Sea using data from Norway where such information is public. – In 2008 we predicted that Norway would find one giant field before the end of 2010. That they did. However, it is becoming easier to obtain statistics from nations that have previously kept these secret. This is due to the fact that all new projects nowadays require international financing. This cannot be obtained without releasing detailed calculations of resources. The potential investors want to know the presumptive number of barrels of oil in order to estimate possible returns. But Kjell Aleklett and his colleagues are not only analysing where oil exists and when it will run out. There are also resources that will probably never be exploited. As an example, Kjell Aleklett points to shale gas. – One of the largest finds of shale gas in Europe happens to lie under Paris. They will never permit the drilling of 15,000 wells in Paris to obtain that gas. At the same time, more and more people, including politicians, are asking whether we will, in fact, increase our energy production with the help of fossil fuels. The climate issue has put an entirely new focus on the question of energy.